There are various reasons that can occasion the need to erase an iPhone, and it is essential to do it properly when such occasions arise. One of the things to have in mind is to understand the dangers inherent in erasing your iPhone especially when you plan to continue using the iPhone in question. Dangers you should be aware of include your settings are gone, passwords are reset, loss of photos and media, messages etc. That said, these things become beneficial if you don’t plan to use the iPhone afterwards. Perhaps you want to give your iPhone out, or you’re returning a company iPhone 7, then erasing all data becomes very essential. Is It Secure to Wipe iPhone 7 from Settings? Most of us who have come across the need to wipe iPhone would have considered doing so through ‘Settings’ in iPhone. However, deleting data manually in such may have its suspicions. It is after all not 100% secure. There can be bugs, viruses etc. that can mess up your deletion process. There are various subtleties that you need to be aware of when wiping your iPhone through the “Settings” menu. However, data deleted in such way are not gone forever, they just become invisible, but in fact, they still be stored in somewhere on your iPhone, and maybe retrieved in some way. To make your private data disappear forever, you should completely destory and overwriten them. Another thing that you need to be aware of is that there can be errors while deleting such a large amount of files. This can cause disruptions and may mess up your iPhone’s crucial setting as well. Also, the files that you do delete are exposed to all types of risks as they can be easily recovered using specialized recovery software. To do this, you can use an application like iMyFone Umate Pro or iMyFone Umate Pro for Mac to securely erase your iPhone. 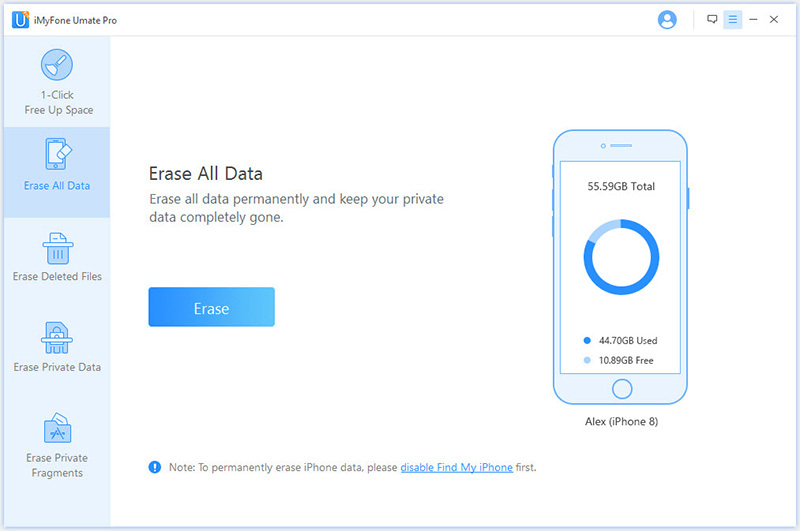 Erase All Data:By selecting this, you will be erasing all data and setting from iPhone, and the data erased is 100% unrecoverable. Erase Deleted Files:The files that you delete normally can still be accessed using various data recovery software. This option allows you to preview such files and completely erase them. Erase Private Data:If you only want to delete private files, you can select this option. You will be allowed to select the files that you deem to be private and erase them accordingly. Recently received product reviews: macworld.co.uk, getintopc.com, pocket-lint.com, macbed.com etc. There are instances that necessitate the need to erase everything on the iPhone iOS 11 including giving your phone out, or selling it to a third-party. Either way, it is not safe and secure to simply delete files manually or use the “Factory Reset” that comes with the iPhone. While the “Factory Reset” deletes everything on the iPhone, the files deleted can be recovered by data recovery tools. The dangers in this can put you in a precarious situation. 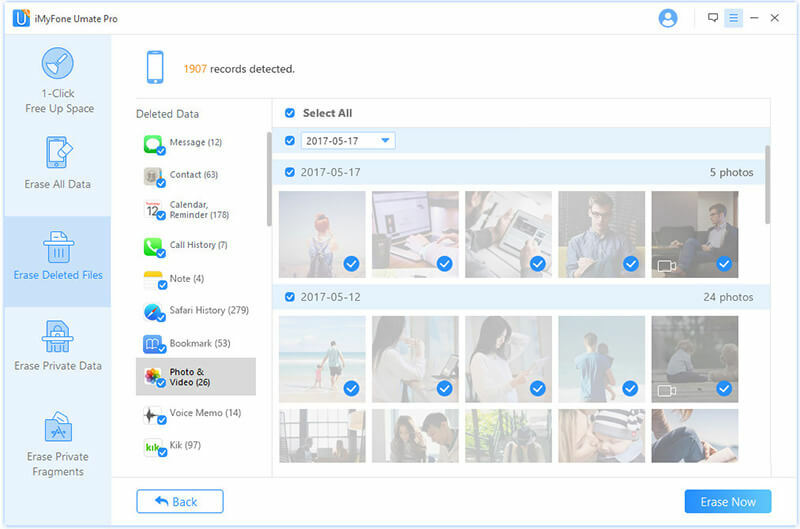 However, using this “Erase All Data” mode of the iMyFone Umate Pro to erase iPhone iOS 11 securely will erase every file and data on your iPhone with a zero chance of being recovered. So even if your iPhone ends up in the hands of nefarious people, you are protected and your privacy is kept secure. This is absolutely priceless, as you can swap your old iPhone 7 for new ones without fear of data or privacy compromise. Have you ever wondered where deleted files go? Like what happens to the files when you delete them? Do they vanish into thin air? Not exactly, the system removes them from your access, but they can still be recovered by powerful tools. That means sensitive files: pictures and videos that you felt you have deleted confidently can be recovered and used against you. 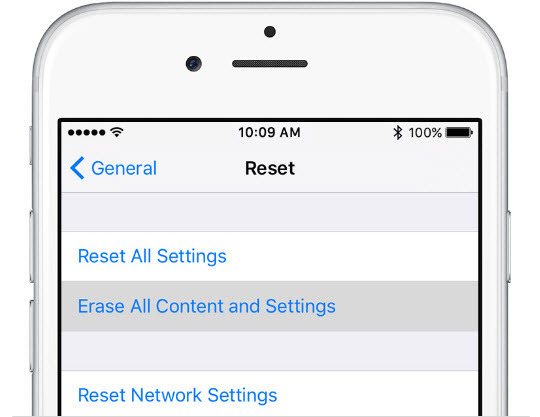 This mode of secure erasing iPhone allows you to permanently delete the files that you have deleted in the past. 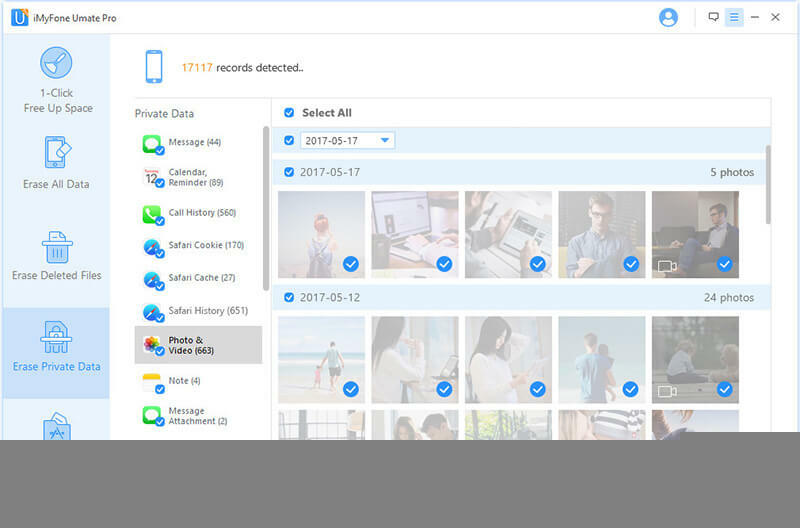 The software scans every nook and cranny of your device to find files you’ve deleted in the past and permanently shred them. With this option, your peace of mind is guaranteed and never will you fret about things you’ve really wanted to go forever. This option scans your iOS 11 device and lists everything on your iPhone 7/7 Plus/6/6s allowing you to choose the data you want to erase. This is similar to the “Erase All Data” mode except that you have a choice on what’s deleted and what’s not. This is particularly useful if you fear your settings and other information might go missing with the “Erase All Data” mode. You now have the power to indulge in those naughty moments because you know you can selectively delete them afterwards. Such power intoxicates! Step 1. Download iMyFone Umate Pro to your computer from iMyFone official site, run the downloaded file and click “Install”, then connect your iDevice – iPhone, iPad and iPod touch. Step 2. Choose the erase mode that fits your need: 1-click space saver, erase all data, erase deleted files, and erase private files and click “Scan” to see what you have to drop or remove. Step 3. Click “Start” to erase data from your device.